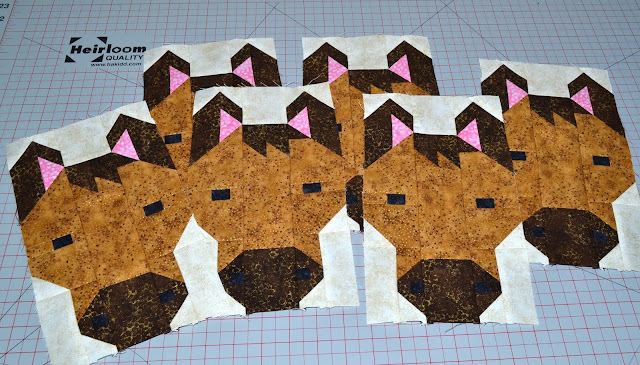 I chose my fabrics for the Farm Friends quilt pattern. Cut everything for the blocks. And started to sew! So far I have completed the 6 of each - Billy Goat, Cow and Horse blocks - needed for the Full size quilt. I can hardly believe how many emails I have been getting! This pattern, apparently, is a big hit! And I am expecting to have the pattern release mid month. Today I am heading to Kingston, Ontario to provide a trunk show tonight for the Limestone Quilters' Guild. And staying overnight to host a workshop the next morning! Looking forward to an incredible couple of days spent with link-minded makers! Patty of Elm Street Quilts is having a "Bag It" event. The purpose of the event is to encourage handmade for the holidays by making and sharing handmade bags. There are a whole bunch of new bag tutorials lined up through late November to inspire. But any bag, any pattern that someone makes and shares can earn them entries into the giveaways. There is a linkup for you to share your own tutorials too! CLICK HERE to check out the details!!! I smile every time I see these guys! Lorna, you're so creative! I can't wait until the patterns come out for them! My family loves horses and cows, all animals actually but one of my nieces is in college for equine, and my daughter has been trying since she was little to get me to agree to a cow in the back yard, it was upgraded to a horse a few years ago when the niece got her first one! Your farm animals are looking great Lorna! Very fun blocks. I really like those horses. Enjoy your trunk show and workshop. Safe travels. You sure have a gift, Lorna! Love your blocks. You have a way of bringing them to life. The billy goat!!! SO cute! You have been so busy lately, do you ever rest?! Love your new patterns - all 3 of them. I liked the horse when I saw it in your IG feed but now seeing them all again... tough to choose. Thanks for the shout out for my Elm Street Quilts Bag It event! Your horses are so adorable!! Have fun in Kingston, Ontario. I think this is so cute. It amazes me how good you are at creating these blocks. So inspirational!!! I really like your horses, but I really love the cow! They're all so cute. I may feel another grandson quilt coming on! I am so happy to hear that there is lots of buzz about your pattern. Not at all surprised tho. You have a great touch with designing these critters. Have fun with the show and workshop!! I can imagine tht you've been getting so many hits on this one is becuase this is so gender neutral and ALL kids love animals of some kind... I can ever hear Old McDonald being sung when playing on this! As always, super cute! Very pretty! I like that herd of horses! Have fun in Ontario! I am loving these new animal heads, the horses are my favorite! Billy Goat reminds me of my childhood. Love! I love your new animals, and those pink ears are so cute!! This is going to be one fun barnyard!